The Narrative Enneagram is an educational nonprofit dedicated to transforming lives and creating a more compassionate world. Our mission is to refine and advance Narrative Tradition programs to transform human consciousness through our unique and unparalleled curriculum, which integrates psychological, spiritual and somatic practice. We present Enneagram trainings in 13 countries worldwide. Our teachers and staff have a long-standing, collective experience unmatched in the field, and each of us strives for spiritual, psychological and emotional freedom, both individually and as part of larger communities. We invite you to become a member of TNE and be part of our diverse international community. 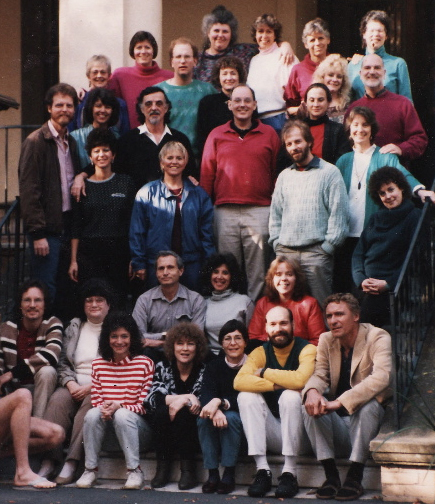 Click on the photo at left to watch co-founders Helen Palmer and David Daniels, pictured in the second row from the bottom, talk about their 25-year collaboration. Stemming from the Greek words ennea (nine) and grammos (a written or drawn symbol), the Enneagram was borne out of ancient tradition. It was introduced to the modern world in 1915 as a human development system by philosopher and teacher George Gurdjieff. In the late 1960s, Oscar Ichazo, founder of the Arica School, placed nine personality types around the Enneagram diagram. Soon after, Claudio Naranjo, MD, and other psychologists in Berkeley, CA, integrated the Enneagram with emerging developments in modern psychology. In the early 1970s, Helen Palmer, a student of Naranjo, began teaching Enneagram panel workshops in the Narrative Tradition. In 1988, she published The Enneagram: Understanding Yourself and the Others in Your Life, a perennial bestseller available in 26 languages. That same year, she co-founded the Enneagram Professional Training Program (EPTP) with Stanford psychiatrist David Daniels, MD. Our organization has evolved as a nonprofit to sustain and promote this foundational work worldwide through an Narrative Enneagram Curriculum that integrates psychology, spirituality and somatics, and other Enneagram programs grounded in the Narrative Tradition. We are an IEA Accredited School. The Narrative Enneagram (TNE) has adopted six values of self-awareness, integrity, transparency, personal transformation, commitment to working out differences, and generosity of spirit. These represent the core priorities of TNE’s organizational culture. Our pledge as teachers and staff is to embody these values in all of our relationships and activities. The Enneagram supports us in our own basic inner life practice. Transforming the world begins with each individual. Through self-awareness, we take responsibility for the quality of our lives and our relationships. The Enneagram invites each of us to be totally honest with ourselves and to live with integrity. This means taking personal responsibility for our actions, for what we bring to relationships, and for communicating both our love and concerns with those who share our lives and our Enneagram work. The Enneagram supports us in open, straightforward and thoughtful communication with others. Transparency also means acknowledging our reactivity and owning our projections. The Enneagram identifies key elements in these three important areas of our lives. When we explore all of them in our education, we experience more freedom and wholeness in mind, heart and body. The Enneagram recognizes all people as equals. Learning to accept ourselves as we are helps us to accept others as they are. When we experience others as we experience ourselves, we know that we are all doing the best we can in the moment. From this stance of compassion for self and others, we create a common ground where differences can be resolved as they arise. The Enneagram is a sacred map that helps in the transformation of human consciousness. As a non-profit organization, we see ourselves as servant leaders giving back to the universe with openness to all. The Narrative Enneagram’s core values – self-awareness, integrity, transparency, personal transformation, commitment to working out differences and generosity of spirit – create a community in which all are welcome and included. Therefore, TNE does not discriminate on the basis of race, ethnicity, religion, creed, gender, gender identity, gender expression, sexual orientation, sexual identity, national origin, age, ability, or marital status.